A maritime climate has some benefits, most noticeably in the moderation of winter temperatures. Walking through Liskeard the other day, I noticed a full-sized potato plant, looking remarkably healthy. I'm assuming it has sprouted from an overlooked tuber and has flourished in the cool, but not cold, weather we've been having; plenty of nasturtiums in Plymouth remain unfrosted. The downside of the close proximity of an ocean is its annoying tendency to deliver incessant low pressure systems and their associated cloud, rain and wind. This winter has been exceptionally turbulent, even by our exacting standards and the coast of Cornwall and other parts of southern Britain are being re-sculpted as I write. Others face the dismal prospect of finding their homes underwater. Let's hope losses of life and property are avoided as much as possible. Several days ago, a lull in proceedings allowed me to get out to Oca Acres and try and tidy up what the wind had scattered. Our soil, a sticky clay, was slippery and totally unsuitable for digging. Despite this, my curiosity got the better of me and I felt the sudden and powerful urge to lift one of my mauka seedlings. They have sat in the ground for three full years since I planted them out; although we haven't had a particularly cold winter in that time, the ground surface has been frozen for several weeks on occasion. Nevertheless, they have sprouted each spring and I have repaid their generosity by doing virtually nothing in the way of weeding or feeding them. What some might call neglect, I refer to as screening for resilience. To my untrained eye, they've looked fine by the summer and have done a good job of suppressing and surpassing the weeds. Folks, this is my kind of plant. Unsatisfied curiosity is something up with which I cannot put: I grabbed a fork and listened for the satisfying squelch as waterlogged soil was lifted; in due course I succeeded in prising a mauka plant from the ground. Although the tops had been frosted off, the underground parts seemed fine, bar a little bit of cracking and scarring. What's not obvious in this picture is that there were dozens of small buds, all waiting to burst into growth as soon as the weather warms up. Mauka seems not to have any innate dormancy, which given our notoriously erratic climate, might be a good thing. It certainly resprouts well after frosting. Unlike oca, which the voles love to consume above all other roots, mauka seems not to be favoured by their attentions. While they are quite content to burrow through the centre of a plant and create underground caverns around its roots in the process, there's precious little evidence of them eating it. I decapitated the plant and buried the top a few inches below the soil surface; with its strange dead man's fingers protruding as I shovelled back the soil, it was a slightly macabre moment. 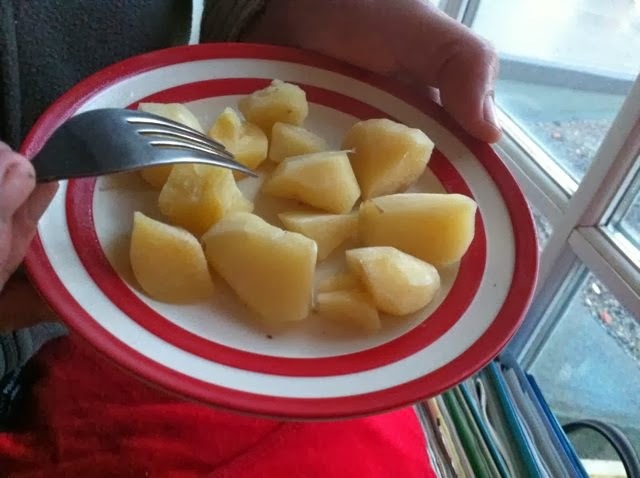 I hurried home with the root and immediately peeled and cut it into chunks. 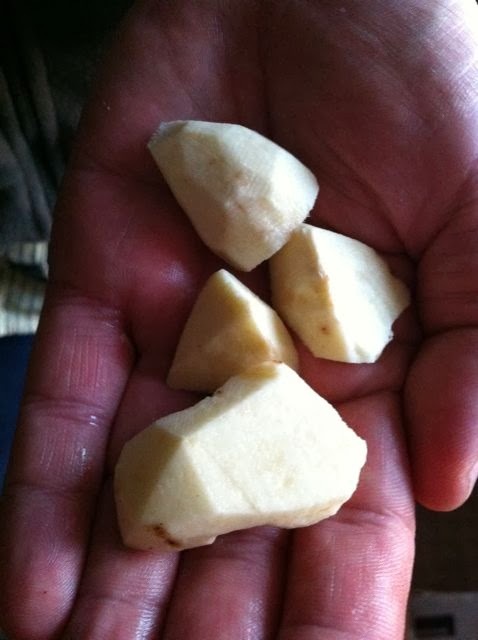 It had very firm, white flesh, which reminded me a little of cassava (Manihot esculenta). Like cassava, the root is said to need careful preparation to remove what the Lost Crops of the Incas describes as an "astringent chemical". In the case of mauka, this is done by leaving it in the sun for a few days. I opted for immediate consumption. I could claim that I did this in the spirit of enquiry, but the truth is simple: I was hungry and couldn't wait for a peekaboo sun to work its solar alchemy. Into a pan of boiling water went the mauka. On cooking, the pieces lost their white colour and became a pale yellow; concentric growth rings, rather like those in a tree, became obvious in cross section. Luckily, however, the mauka morsels weren't woody, but firm in texture, with a sweet and very pleasant taste. There were a few chewy fibres near the centre of some of the chunks, but considering the root was three years old, it was remarkably good eating. I did detect a slight ticklish irritation at the back of my throat after I'd gulped down a generous handful of the pieces. It was similar to the sensation I experience following the consumption of fuchsia berries. I suspect it was caused by the presence of raphides, little needle-like crystals of calcium oxalate which are present in both fuchsia berries and mauka. According to Lost Crops of the Incas, plants are supposed to vary in their acridity, with Ecuadorean specimens being noticeably sweeter. There is some evidence that, in the case of taro (Colocasia esculenta) at least, the raphides are tipped with a protease, which increases the swelling and irritation caused. Perhaps mauka is similar. Individuals vary in their sensitivity to these things; as I may have mentioned previously, some people will happily gulp down plants which I find thoroughly unpleasant. Mauka is definitely a tasty root crop, raphides notwithstanding. It's also surprisingly resilient, in Cornish conditions at least. I could certainly learn more about how to prepare and cook it and I wouldn't yet describe my leave-it-alone cultivation methods as being definitive. When the rain stops and the wind subsides, I might just nip out and continue my fork-to-fork investigations into a fascinating foodstuff. Sounds a lot more promising than machua, on the plate. Believe me, Madeline, it is. Your voles have had a better education than mine...they love it here, and eat the whole roots in autumn if I'm not fast enough to dig them out. I have some plants, in pots, that remained green this (unusually mild ) winter. No signs of flowerbuds though, maybe 8 hours of daylight is too short for the development of flowers. It just goes to show how nothing in gardening is universal. Maybe our voles are puny little wimps compared to yours, or maybe it's the sacrificial crop of ocas I leave them every year, usually more by accident than design. I've noticed that mauka plants will stay green if they don't get frosted, but like yours, they don't seem keen to flower. I like the concept of "screening for resilience"
When is an artichoke not an artichoke? When it's either Helianthus tuberosus or Stachys sieboldii. 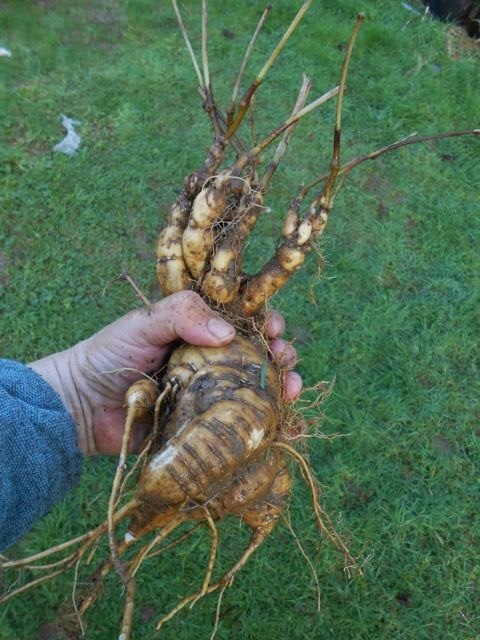 The former is theJerusalem artichoke, neither from Jerusalem, nor an artichoke, although like its namesake, it is a member of the daisy family; the latter is the Chinese artichoke, which does occur in China, but is actually a member of the mint family, the Lamiaceae, rather than an artichoke sensu stricto; true artichokes are naught but overgrown thistles in the genus Cynara. These are Chinese artichokes, freshly lifted. I wonder whether they were the inspiration for the Michelin man? If it looks like a duck and quacks like a duck, then it probably is a duck. So my achira, which looks like a bog standard purple canna, is indubitably a canna, just like the ones gracing a roundabout near you. Mine came with the moniker "achira morada", purple achira. I've had it for years. At one time achira was afforded the honour of species status, Canna edulis; now it seems to be considered a variety of Canna discolor or Canna indica. It comes from - you've guessed it - the Andes. For some peculiar reason I haven't managed to kill my achira, despite letting it dry out, get frosted and most recently, leaving it in a greenhouse to cook at about 48 degrees Celsius for several days. I wouldn't say that achira thrives on any of this treatment, but it is remarkably tough. I haven't yet tried it underwater, but I've got form, what with the mashua and oca waterlogging debacle last year. Imagine a not-uncommon weed, one which any self-respecting gardener would evict from her garden with alacrity. A bed choking thug, which although short in stature, compensates by spreading sideways with panzer-like rapidity. It turns out that this self-same plant has been helping keep the hungry alive on several continents for centuries. Even more incredibly, it is now doing sterling work in preventing infant malnutrition. So who, or what is this sinning saint, this sweetpotato of the north? 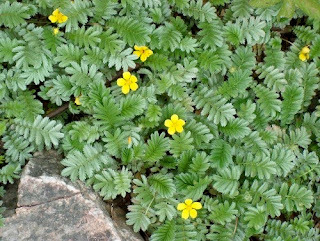 I'm talking about none other than silverweed (Potentilla anserina). Even if you don't know this plant, the chances are that you've walked on it or passed close by.